This technical document describes some of the issues that may be encountered when using the StarQuest Data Replicator. Place double quotes around the column names used in the critera e.g. WHERE "ZIP">89999 AND "ZIP"<95000. Note: using criteria when configuring an incremental subscription from a Microsoft SQL Server source or from a DB2 for i source (where the tables are journaled with *AFTER images) is supported by SQDR 4.50 & later and SQDR Plus 4.50 & later. Solution: Incremental replication of a table journaled with IMAGES(*AFTER) must use RRN. Go to the Columns tab of the subscription and select the checkbox Create target unique index using source table RRN, select OK to save the change, and run the subscription again. Note that this checkbox is automatically selected (and enforced) when the source does not contain a primary key or a unique index. If you are experiencing problems such a hung subscription, StarQuest Support may request that you create a dump of the SQDRSVC.EXE process using Task Manager. Start Task Manager by right-clicking on the Taskbar and selecting Start Task Manager, or entering the command taskmgr. Note that if you are running the 32-bit version of SQDR on a 64-bit system, it may be necessary to start the 32-bit version of the Task Manager by running C:\Windows\SYSWOW64\taskmgr.exe. Select the checkbox Show processes from all users. Locate the entry for the SQDRSVC.EXE process, select and right click, and select Create Dump File. The selection will produce a dialog with the exact location of the sqdrsvc.dmp file - e.g. C:\Users\myuser\AppData\Local\Temp. Locate the file and send a compressed copy to StarQuest. Issue: A user created a Staging Agent for a SQL Server source using SQDR Control Center. That definition includes the database name of the SQL Server database, and creates a schema in that database called SQDR, containing some control tables and the stored procedure TableInfo(). Next, the user wished to create incremental subscriptions residing in a different database residing on the same SQL Server. He chose the second database when configuring the source in Data Replication Manager, but the table list in the Subscription Wizard continued to return a list of tables from the first database. Solution: It is necessary to create an SQDR Plus Staging Agent for each SQL Server database. After creating and starting the second Staging Agent with SQDR Control Center, return to Data Replication Manager and either create a new Source or modify the existing Source; go to the Advanced Panel and select the appropriate value from the Capture Agent Schema dropdown. Now the Subscription Wizard will invoke TableInfo() from the correct database. Replication failed. The insert thread timed out waiting for a filled fetch buffer. Solution: The problem was a resource wait on the destination SQL Server; the default timeout of 30 seconds was too short. Using Data Replicator Manager, right-click on the Service name and select Properties. Increase the MutliThread Timeout from the default of 30 seconds to 300 seconds. [Microsoft][SQL Server Native Client 11.0][SQL Server] Database 'ControlDB' is being recovered. Waiting until recovery is finished. Solution: Confirm that Auto_Close is enabled and disable it. The Application Event Log contains many informational messages that state Starting up database 'dbname'. Using SQL Server Studio, right-click on a database, select Properties, and select the Options page. Note that you may need to use the scroll bar to view the beginning of the Options list. Using SQL Server Studio, change the value of Auto Close to False. [StarSQL][StarSQL ODBC Driver][DB2 Universal DataBase]The value of a host variable in the EXECUTE or OPEN statement is too large for its corresponding use. Solution: This error may occur when some characters are converted into multi-byte characters and the size of the target table's character columns is inadequate. Modify the subscription and increase the size of the affected columns on the target table. You can use the Character data destination precision heuristic to specify an inflation percentage; see the SQDR Help for the Service Properties Subscription (Wizard) Tab. Solution: This error can occur if the IP address of the system has changed since the incremental group was created; for instance, you are using DHCP rather than a static IP address. Select the Source associated with your subscriptions, right click and select Pause. This will pause all the IR Groups for the source. Select the same source, right click and select Properties... and select the Advanced panel. Select a valid IP address from the dropdown field for IP addresses associated with the notification address and click OK. If both SQDR Plus and SQDR (tiers 2 and 3) are installed on the same machine, we recommend using 127.0.0.1. Right click on the Source and select Resume. All your IR groups should resume normally. SQDR can connect to Informix databases using either the IBM Informix ODBC driver, the IBM DB2 ODBC driver, or the SQDR-bundled ODBC driver. Each of these drivers have advantages and disadvantages. In most cases, the IBM Informix ODBC driver is recommended. However, an advantage of the IBM DB2 ODBC driver is that it uses the DRDA protocol to communicate with Informix, and thus can communicate through a StarPipes Gateway or through an intermediate DB2 LUW system acting as gateway. To use StarPipes as a gateway, create a route to the Informix system in the StarPipes configuration e.g. RDB name=ifxdb, Host name=ifxserv, Port 9089, and configure SQDR to connect to the Informix database through StarPipes using the IBM DB2 ODBC driver, using the connection string HOSTNAME=mystarpipes;PORT=2000;DATABASE=ifxdb. and configure SQDR to connect to the Informix database through DB2, using the connection string HOSTNAME=mydb2server;PORT=50000;DATABASE=ifxdb. To avoid a recv_socket timeout.error when connecting through StarPipes, right-click on the server name, select Properties, select Connection Pools panel, and set the Login timeout to 0. It is not necessary to restart the SQDR service. When connecting through DB2 LUW, creating subscriptions and verifying criteria in the Subscription Wizard may fail with a syntax error. Right-click on the server name, select Properties, and uncheck Quote SQL identifiers on the Subscription Wizard panel. . It is not necessary to restart the SQDR service. After creating the subscriptions, you can revert Quote SQL identifiers to its default setting (checked). These SQDR configuration changes are not required when connecting directly to the Informix server. Delete of existing rows in destination table failed. [StarSQL][StarSQL ODBC Driver][DB2/400]The UPDATE or DELETE statement does not include a WHERE clause. Solution: This (misleading) error message was the result of an isolation level mismatch in the StarSQL ODBC data source and the journaling characteristics of the destination library. In this case, the DSN was configured for IsolationLevel=2 (Read Committed), but the destination library was unjournaled. The issue was resolved by either changing the IsolationLevel in the DSN to Default, or by replicating to a journaled collection. Unhandled exception at 0x776EA899 (ntdll.dll) in xxxxxxx.7356.dmp: 0xC0000374: A heap has been corrupted (parameters: 0x77725910). Solution: This error can occur due to a bug related to SetLocale() in the Microsoft Visual C++ 2013 Redistributable package (used by the MySQL ODBC driver). Use the Programs and Features control panel to examine the version of Visual C++ 2013 Redistributable installed and, if necessary, update it from 12.0.21005.1 to 12.0.40649.5. See Update for Visual C++ 2013 and Visual C++ Redistributable Package for details. Note: SQDR v5.01 and later is built using Visual C++ 2017, so this hint is applicable only to earlier versions of SQDR. 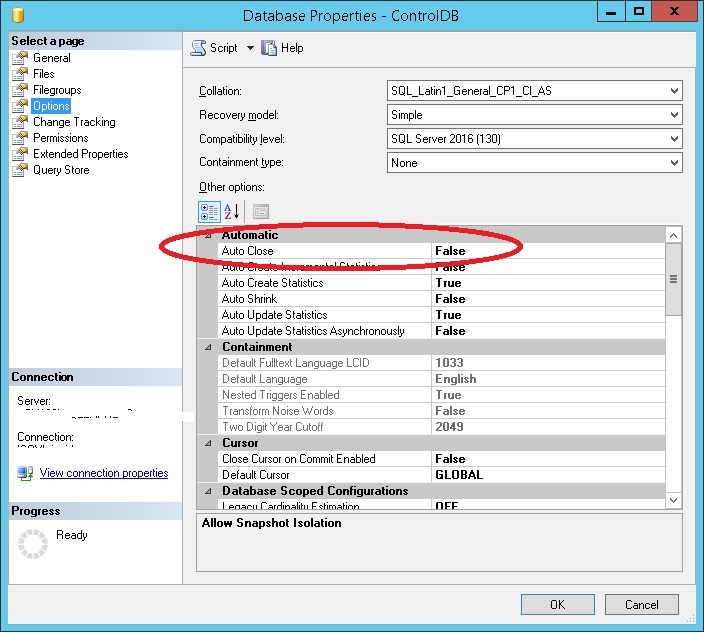 ODBC message: SQLSTATE IM003, native error 160. Solution: Restart the SQDR service. The installer for some ODBC drivers, such as SQDR Salesforce, modify system environment variables such as PATH, and it is necessary to restart the SQDR service so it is using the modified environment. Solution: During creation of a subscription using this driver as a destination, select Insert using ODBC rather than the default of Use native-loader function in the Replication Options of the Destination panel. Symptom: On starting Data Replicator Manager immediately after starting the service (or if the service is started by starting Data Replicator Manager), the application waits at the splash screen for an extended period of time. Delays in contacting a StarLicense license server. Inability to reach legacy source or destination databases. A change to SQDR was made in May 2017 that requires at least one connection to each source and destination to gather database information, even if there are no active subscriptions, and SQDR will continue to try to contact these database servers at startup until a connection is made. We recommend removing obsolete sources and destinations. Symptom: Response in the Data Replication Manager is sluggish, for instance when expanding and collapsing. Solution: This condition can happen if you have a large number of subscriptions and history logging grows beyond a certain limit. Right click on the server name, select Properties, and select the Logging panel. Confirm that Limit replication history logging is enabled, and that the values for Maximum total number of history records and Maximum records per subscription are at a suitable level; the recommend values will depend on the number of subscriptions you have, and how much history you want to save. For instance, you may choose to use something like Total records=5000 and Max records per subscription=10.